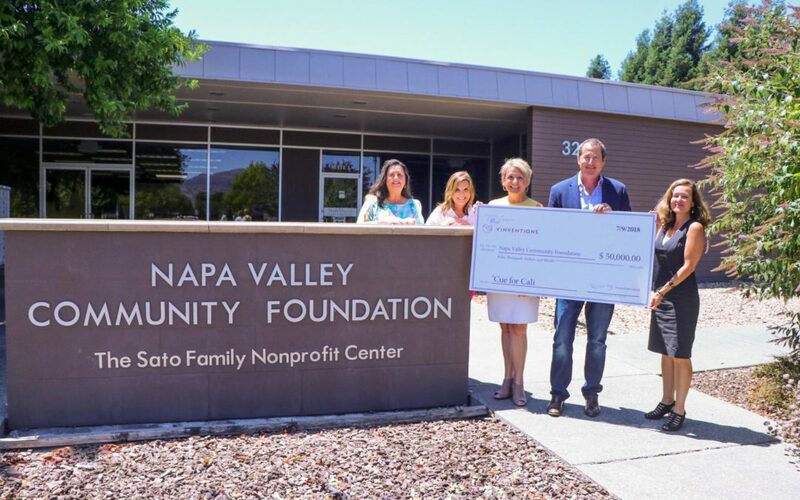 Napa County, CA (July 11, 2018) — Triangle Wine Experience and Vinventions, together with wine lovers throughout central North Carolina, are proud to announce the donation of $100,000 to the community foundations of Napa Valley and Sonoma County in support of California wildfire relief. 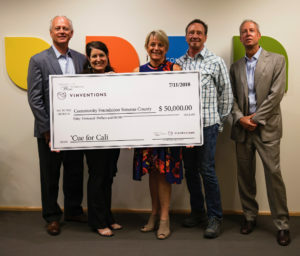 After watching the devastating fall 2017 fires overtake the vineyards and homes of close friends, the leadership teams at Vinventions, the global leader in complete closure solutions to the still and sparkling wine industry, andTriangle Wine Experience, the largest fundraiser for Frankie Lemmon School & Development Center, were committed to doing whatever they could to help. On June 15th, 2018, the two companies hosted the Raleigh-based ‘Cue for Cali event, drawing a crowd of more than 300 people and raising just over $100,000. The event featured award-winning chefs, including barbecue from James Beard winner and “Best Chef of the Southeast” Rodney Scott, James Beard nominee Sam Jones of Skylight Inn, as well as California wines provided by Reynolds Family Winery, Crocker & Starr and Davis Family Vineyards. 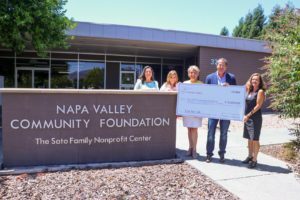 The donations were presented this week to the Napa Valley Community Foundation and the Community Foundation of Sonoma County by representatives of Vinventions and Triangle Wine Experience. The donations will go towards the community foundations’ wildfire relief funds, the Sonoma County Resilience Fund and the Napa Valley Community Disaster Relief Fund. Vinventions was created in 2015 by family entrepreneur Marc Noël together with Bespoke Capital Partners, Heino Freudenberg and further partners. Vinventions’ mission is to be the most innovative and most trusted global supplier of complete wine closure solutions to the still and sparkling wine industries. Since January 2015, Vinventions has acquired Nomacorc, Ohlinger Group, Syntek Bouchage and Alplast wine-screwcaps and has created Strategic Partnerships with industry leaders such as Cork Supply (natural cork) and Alplast (screwcaps). This led to the creation of Vinventions’ “House of 7 Brands” to offer complete wine closure solutions, which encompass Nomacorc (PlantCorcs), Syntek (synthetics), Ohlinger (natural corks), Vintop (screwcaps) and Alplast (screwcaps) as well as Wine Quality Solutions (oenological services and analyzers) and Wine Marketing Solutions (marketing services). Today, Vinventions employs over 550 associates globally and operates seven production sites in USA, Belgium, Germany, France, Argentina, South Africa and China. Vinventions protects every seventh wine bottle worldwide with its closure solutions. The leadership values of Vinventions are based on customer proximity, innovation, local entrepreneurship, open teamwork, sustainability and long-term responsibility. Find out more at www.Vinventions.com. The Triangle Wine Experience is the Triangle and Carolina’s premier wine event encompassing tastings, dinners, and a Grand Gala with a fine wine auction over a three-day period. Winemakers and wineries from all over the world participate in this amazing event. All proceeds from the Triangle Wine Experience benefit the Frankie Lemmon Foundation, a non-profit organization dedicated to the education and support of children with special needs. Read more at www.trianglewineexperience.org and www.frankielemmonschool.org.